It's a common feature of long distance driving: the Internet dead zone. Usually when you most need directions or have to make a call, you're in the middle of nowhere with no signal and a lot of frustration. But an answer could be coming from the sky. Toyota has unveiled a concept car built with satellite Internet technology that can get online from just about anywhere and doesn't require a bulky dish antenna or a mechanical system that tracks satellites. The car is on show at this week's North American International Auto Show in Detroit and uses a flat antenna technology from Kymeta, a Washington-based electronics company. The two have been working together for a little over two years on how to extend Internet connectivity to cars anywhere without compromising the stylish lines of the modern automobile. And that's where the flat antenna technology comes in. The concept is built into a Mirai, Toyota's first hydrogen-powered passenger car, and the antenna is in the roof. 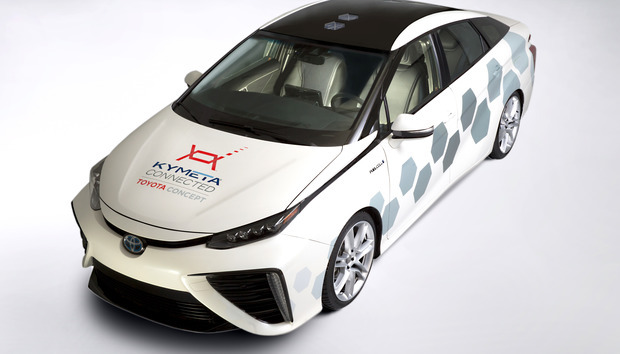 Antennas on Toyota Mirai concept fitted with Kymeta's satellite Internet system. Toyota said it's looking at wider use of satellite communications in cars in the future because it offers several benefits including the ability to send large amounts of data to cars, covers numerous countries so would help broad deployment of connected cars based on the same technology, and offers more stable and secure communications, particularly in emergencies such as natural disasters. The idea is being aided by a new breed of telecommunication satellites that are specifically designed for data communications and Internet service and have more focused and localized beams than those of the past. These satellites deliver faster data speeds and a more powerful signal, simplifying the reception system. The interior of a Toyota Mirai concept fitted with Kymeta's satellite Internet system. The results from this prototype must be encouraging for Toyota. Earlier this month, the Japanese automaker gave Kymeta $5 million to continue working and enhancing the system. Toyota has an exclusive right to test and develop the on-car antenna and said the investment is expected to accelerate the joint research, so aerodynamic satellite Internet for cars might not be as far fetched as it seems.